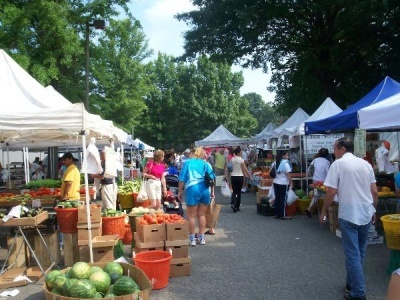 Organized by the Fairfax County Park Authority, these Farmers' Markets offer a wide variety of freshly picked fruits, vegetables, herbs and cut flowers. There are also fresh eggs, baked goods, fresh pasta, honey, jam, teas and cider to purchase. Milk and cheese products, and homemade ice cream, along with a wide array of meat products, round out the edible delights offered. If gardening is an interest, many vendors have small plants at the beginning of the season, while other vendors have larger landscape plants for those ambitious projects. Master Gardener Plant Clinic on site, at both Mason District and Wakefield Park, to answer questions about plants in your landscape. Vendors must grow, raise, or produce their own products within a 125 mile radius. 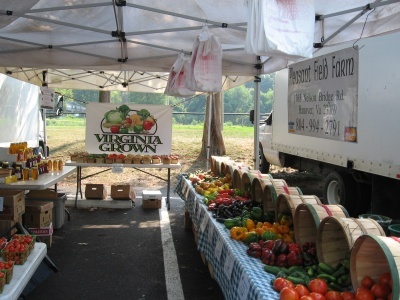 The mission of these markets is to support local agriculture within the Chesapeake Bay Watershed area. Directions: Beltway (Route 495) exit 52B (Little River Turnpike, Route 236) east 2 miles to left at John Marr Drive and right on Columbia Pike to park entrance on right just before Sleepy Hollow Road. 703-941-1730. FJ Median & Son Farm - seasonal produce such as strawberries, corn, melons, tomatoes, squash, peppers, etc. Great Harvest Bread Company - wide variety of freshly baked from scratch whole grain breads, mixes, granolas, and an assortment of sweets and cookies. Honeycomb Heroes - three varieties of raw honey, including wildflower, apple, and creamed spun honey along with beeswax care products, and beeswax candles. J&W Valley View Farm - the freshest best tasting fruits and vegetable possible. Layla's Lebanese Restaurant - Lebanese cuisine made with fresh ingredients daily. Pickle Factory - Different variety of fresh cut pickles made into dill pickles with different flavors,sweet bread & butter,mini dill,chips,whole kholser,spears,jalapeño,habanero,sour, sold in pint or quarts sizes. Sharkawi Farm - 40 different varieties of potted herbs, Flowering and edible potted plants, mixed salad green baskets, greenhouse cucumber, fresh figs, Fall pansies, and dried lavender, we also manufacture 48 different teas, spices, and spice mixes. Valentine's Bakery & Meats - homemade baked goods such as fruit pies, cookies, sweet breads, granola, whoopie pies, and gluten-free items plus a variety of fresh fruit jams. Free-range, grass-fed, beef, pork, lamb, and chicken and farm-fresh free-range pastured eggs from happy healthy chickens. Master Gardener Plant Clinic on site to answer questions about plants in your landscape. Directions: From Beltway (Route 495) exit 54A (Braddock Road) go west 1/4 mile to entrance of park on right. 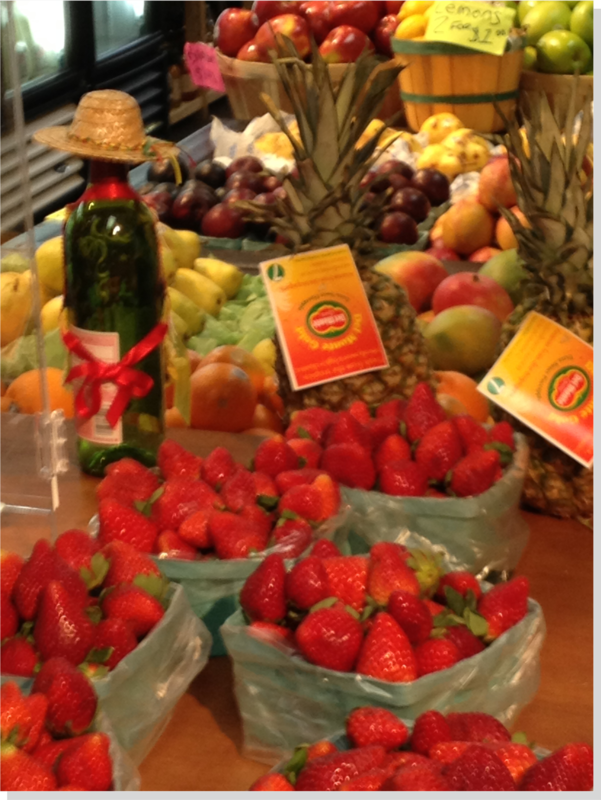 From Burke: East on Braddock Road to left at Queensberry Ave.
Barajas Produce – fresh vegetables and berries. Bread and Water Co. – Breads and pastries. Countless Blessings Farm– Meet and eggs from pasture-raised animals, baked goods. F.J. Medina & Son Farm– Strawberries, corn, melons, tomatoes, squash, peppers, and other produce. Kuhn Orchards– Apples, pears, peaches, apricots, plums, berries, cherries, grapes, rhubarb, asparagus, tomatoes, onions, garlic, sweet potatoes, leeks, pumpkins, herbs, flowers. Lois’s Produce– Asparagus, onions, radishes, strawberries, sweet potatoes, broccoli, cauliflower, cabbage, green beans, peas, cucumbers, squash, tomatoes, sweet corn, eggplant, elephant garlic. Nitro’s Creamery, – Homemade, handcrafted ice cream made to order using liquid nitrogen. Salsa Las Glorias – Homemade salsa from locally grown vegetables without preservatives, food coloring, or added water. Stallard Road Farm & Botanicals – Eggs, honey, mushrooms, herbs, herbal products, and grass-fed beef. Sue’s Pies and More – Pies and other baked goods. Wholesome Clean Eating – Small-batch, gourmet plant-based eats from natural and sustainable grown produce. Pets are not allowed at farmers markets except service animals.